2. Spray a baking sheet with cooking spray. 3. Finely zest the orange and set the zest aside. 4. In a shallow bowl, whisk the egg white until slightly frothy. In a separate shallow bowl, combine orange zest, almonds, salt and pepper. 5. Put the flour on a large plate. 6. Dip the chicken breast first in the flour, then into the egg whites, and then into the almond mixture. 7. Place the chicken breast on the baking sheet and spray the top with cooking spray. Bake for 6 minutes. Turn and bake for 6 minutes more until the chicken is cooked through. Spread the hummus inside the pita half. Fill with spinach and carrots and serve. 1. Heat a nonstick skillet or grill pan over medium-high heat. Coat fish with cooking spray. Add fish to pan, and cook 6 minutes on each side or until fish flakes easily when tested with a fork. 2. While fish cooks, pierce potatoes with a fork; arrange in a circle on paper towels in a microwave oven. Microwave on HIGH 8 to 10 minutes, rearranging potatoes after 5 minutes. Let stand 5 minutes. 3. Cut cooked potatoes in half, and sprinkle with salt, pepper, and cheese. (Remember to cut down on sodium, limit how much salt is added here). 4. Combine greens, tomatoes, and vinaigrette in a bowl; toss gently. 5. Cut lemon in half, and squeeze lemon juice over fish. 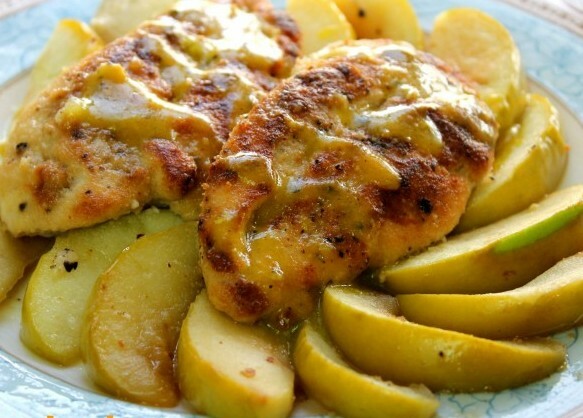 Serve with potatoes and salad. 1. Combine yogurt, mayonnaise, garlic powder, pepper and salt in a medium bowl. 2. Halve eggs and discard 4 of the yolks. Add whites and the remaining 4 yolks to the bowl and mash to desired consistency. Gently stir in avocado, bacon and blue cheese. 1. Combine beans, cheese and 1/4 cup salsa in a medium bowl. Place tortillas on a work surface. Spread 1/2 cup filling on half of each tortilla. fold tortillas in half, pressing gently to flatten. 2. Heat 1 tsp oil in a large nonstick skillet over medium heat. Add 2 quesadillas and cook, turning once, until golden on both sides, 2-4 minutes. Transfer to a cutting board and tent with foil to keep warm. Repeat with the remaining 1 tsp oil and quesadillas. Serve the quesadillas with avocado and the remaining salsa. Whisk mayonnaise, yogurt, lemon juice and salt in a large bowl. Add chicken, apples, grapes, celery and 1/4 cup walnuts. Stir to coat well. Serve topped with the remaining 1/4 cup walnuts. 1. Have four 15-ounce cans and a medium skillet ready by the stove. 2. Combine Cheddar, zucchini, carrot, onion, salsa and jalapeno in a medium bowl. Divide among 4 slices of bread and top with the remaining bread. 3. Heat 1 tsp canola oil in a large nonstick skillet over medium heat. Place 2 panini in the pan. Place the medium skillet on top of the panini, then weight it down with the cans. Cook the panini until golden on one side, about 2 minutes. Reduce the heat to medium-low, flip the panini, replace the top skillet and cans, and cook until the second side is golden, 1-3 minutes more. Repeat with another 1 tsp oil and the remaining panini. 1. Combine first 4 ingredients in a large bowl, stirring with a whisk. Add lettuce and next 4 ingredients (through tomatoes), tossing to coat. 2. Heat a large nonstick skillet over medium-high heat. Coat pan with cooking spary. Working with 1 flatbread at a time, cook bread 1 minute on each side or until toasted. Rub 1 side of each flatbread with cut sides of garlic. 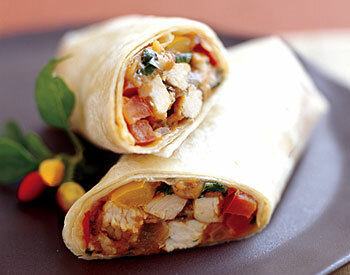 Arrange 1 1/2 cups chicken mixture in the center of each flatbread; roll up. 1. Bring 3 quarts water to boil in a Dutch oven. 2. Heat a large nonstick skillet over medium-high heat. Add oil to pan; swirl to coat. Add asparagus; sauté 3 1/2 minutes. Add garlic; sauté for 1 minute. Add tomatoes; cook for 5 minutes or until tomatoes are tender. 3. Combine cheese, salt, pepper, and egg in a large bowl, stirring with a whisk. 4. Add pasta to boiling water; cook 10 minutes or until al dente. Drain and toss pasta immediately with egg mixture. Add tomato mixture, tossing until sauce thickens. Divide pasta equally among 4 bowls. Sprinkle each serving with 1 Tbsp basil. Serve immediately. 1. Heat oil in a large nonstick skillet over medium heat. Add garlic to pan; cook 1 minute, stirring frequently. Stir in chili powder and salt; cook 30 seconds, stirring constantly. Stir in 1/3 cup water and beans; bring to a boil. Reduce heat, and simmer 10 minutes. Remove from heat; stir in salsa. Partially mash bean mixture with fork. 2. Warm tortillas according to package directions. Spoon about 1/3 cup bean mixture into center of each tortilla. 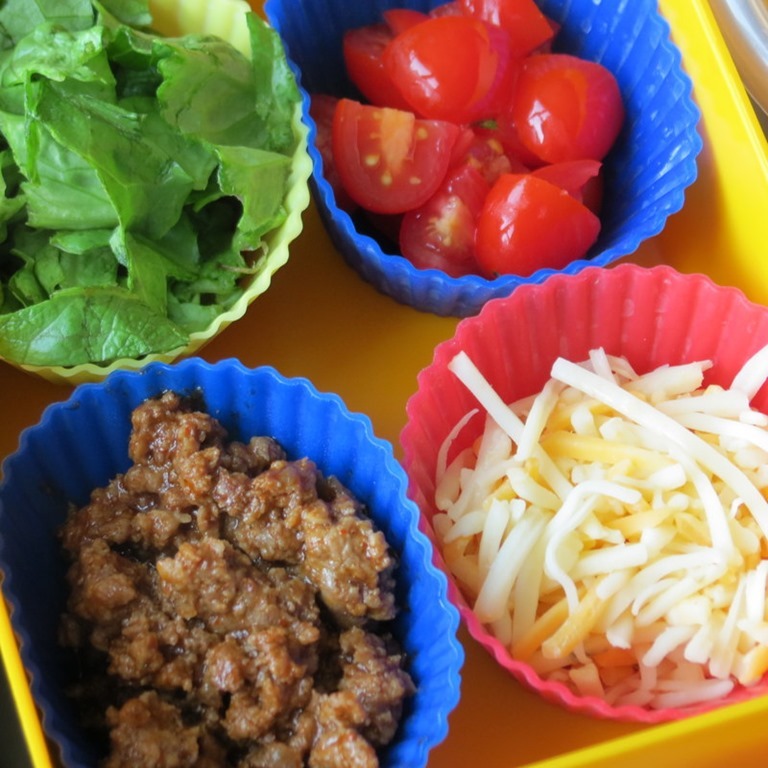 Top each serving with about 2 1/2 Tbsp cheese, 1/4 cup tomato, 1/4 cup lettuce, 1 Tbsp onions, and 1 Tbsp sour cream; roll up. Combine first 4 ingredients, tossing with a fork until well combined. Spread about 2 1/2 Tbsp cheese mixture onto each of 4 bread slices; top each sandwich with 2 tomato slices and 1 bread slice. Combine first 4 ingredients in a small bowl; set aside. Combine chicken and next 5 ingredients (through chickpeas) in a large bowl. Add yogurt mixture to chicken mixture; toss gently to coat. 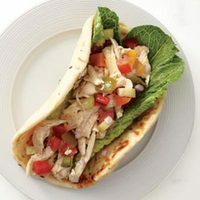 Line each pita half with 1 lettuce leaf and 1 tomato piece; add 1/2 cup chicken mixture to each pita half. 1. Heat a large grill pan over medium-high heat. Brush onion, bell pepper, and eggplant with 1 Tbsp oil. Add onion and bell pepper to pan; cook 3 minutes on each side or until grill marks appear. Remove from pan; coarsely chop vegetables. Combine vegetables, remaining 1 Tbsp oil, parsley, and salt; toss to combine. 2. Spread 1/4 cup hummus over each flatbread, leaving a 1/2 inch border around edges. 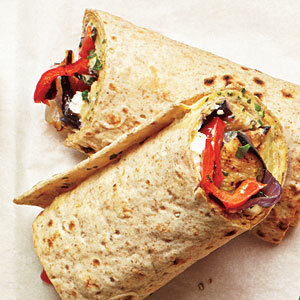 Divide vegetables over each flatbread; top each serving with 2 Tbsp cheese. 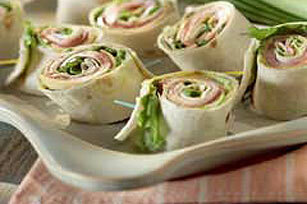 Roll up wraps, and cut diagonally in half. In a large sauté pan, warm the olive oil over moderate heat. Add the onions and sauté for 5 minutes. Add the garlic, bell peppers, sweet potatoes, beans, tomatoes, broth, brown sugar, fresh ginger, cumin, salt, pepper, allspice, cinnamon, and peanut butter, and bring to a boil. Reduce heat to low and simmer until vegetables are soft, about 30 minutes. Serve with cilantro and red pepper flakes. In a large pot, warm the olive oil over medium-high heat. Sauté the onion for 4 minutes or until soft. Add parsnips, green beans, and carrots, and continue to cook for 5 minutes, stirring occasionally. Add chicken broth, bring to a boil and then add quinoa. Cover and simmer for 10 minutes. Add asparagus, white beans, and chicken, season with salt and pepper, and cook for 5 minutes more, or until the chicken is heated through. In a heavy stock pot, warm the olive oil. Add the onion and sauté over medium heat until soft, about 3 minutes. Add the garlic and sauté for 1 minute, then add the chili powder, cumin, and chicken to the pot. Cook for 4 minutes, then add the canned tomatoes, black beans, corn and chicken stock. Bring to a boil, then turn down the heat to low. Simmer for 30 minutes. Serve in bowls with the garnishes of your choice. 1. Place salmon in a large skillet. Add 1/2 cup wine and enough water to just cover the salmon. Bring to a boil over high heat. Reduce to a simmer, turn the salmon over, cover and cook for 5 minutes. Remove from the heat. 2. Meanwhile, heat oil in a medium skillet over medium-high heat. Add shallot and cook, stirring, until fragrant, about 30 seconds. Add the remaining 1/2 cup wine; boil until slightly reduced, about 1 minute. Stir in lemon juice and capers; cook 1 minute more. Remove from the heat; stir in sour cream and salt. 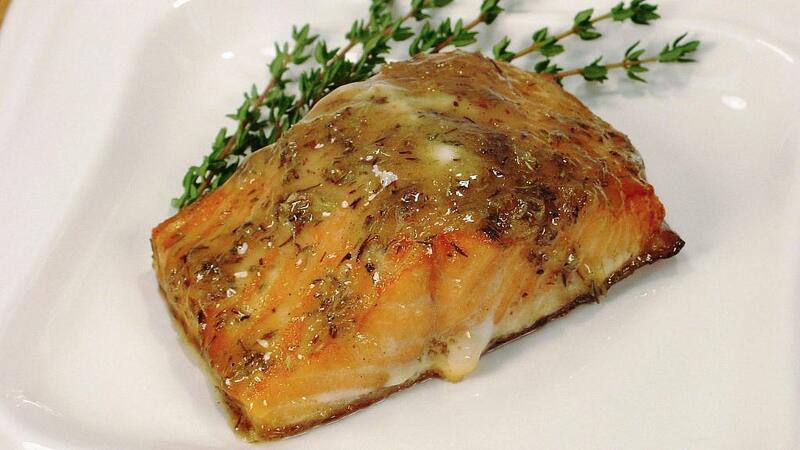 To serve, top the salmon with the sauce and garnish with dill. 1. Rinse beans before adding to pot. Add all ingredients into a large soup pot and let simmer on medium for 30 minutes to let flavors meld. 2. Serve with low-fat shredded cheese and sour cream on the top. Prepare couscous according to directions on box. Fluff with fork, cover, and set aside. dried fruit to skillet and stir until warmed through, about 5 minutes. Put into large bowl and add couscous and spinach. 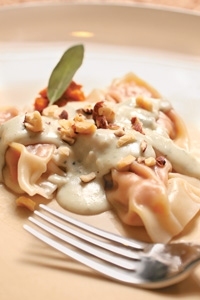 Serve with romaine leaves for scooping and eating the Mo-Rockin’ meal! into a bowl and add the breadcrumbs and egg whites and combine thoroughly. Let sit in the refrigerator for 30 minutes. Make the Carrot Salad: In a large bowl, combine carrots, pineapple, and raisins. In a separate small bowl, stir honey and yogurt until blended. Toss with salad. Preheat the grill. Shape the burger mix into 5 patties and grill on grill topper/ basket until cooked through and crispy on each side, about 5 minutes per side. 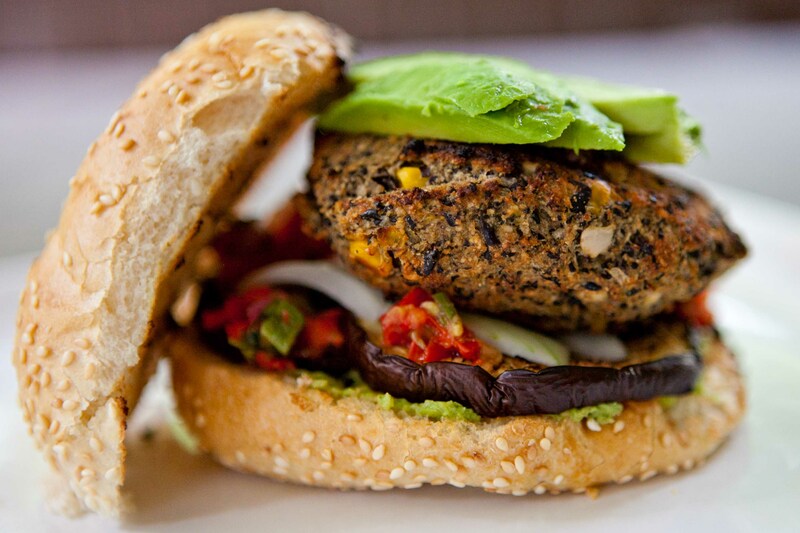 Black Bean Burgers and serve with Carrot Salad. Preheat oven to 400°F. Place the salmon in a baking dish skin-side down. in the refrigerator for 20 minutes. to low, and cover. 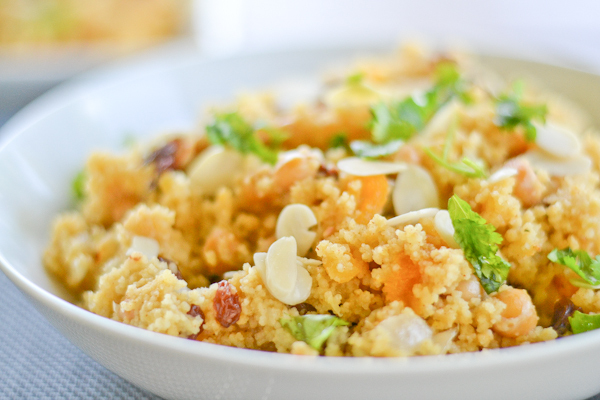 Cook for 15 minutes or until quinoa and carrots are tender. until its golden and flaky towards the edges. Soak chickpeas in enough cold water to cover them by2 inches for 6 hours overnight. (Alternatively, use the quick-soak method: Place beans in a large pot with enough water to cover by 2 inches. Bring to a boil over high heat. Remove from heat and let stand for 1 hour). Drain when ready to use. Combine the soaked chickpeas, squash, carrots, onion, lentils, broth, tomato paste, ginger, cumin, salt, saffron and pepper in a 6 quart slow cooker. Put on the lid and cook on low until the chickpeas are tender and the lentils have begun to break down, 5 to 6 ½ hours. Stir in lime juice. Serve sprinkled with peanuts and cilantro. Whisk together 2/3 cup extra-virgin olive oil, 2 tablespoons lemon juice, parsley, garlic, basil, 2 teaspoons black pepper in a bowl and pour into a re-sealable plastic bag. Add the tilapia fillets, coat with the marinade, squeeze out excess air, and seal the bag. Marinate in the refrigerator for 1 hour. Prepare the mango salsa by combining the mango, red bell pepper, red onion, cilantro, and jalapeno pepper in a bowl. Add ¼ cup lime juice and 2 tablespoons lemon juice and toss well. Season with black pepper to taste. Refrigerate the salsa until ready to serve. Preheat grill to medium-high heat and lightly oil grate. Remove tilapia from marinade and shake off excess. Discard the remaining marinade. Grill the fillets until the fish is no longer translucent in the center and flakes easily with a fork, 3-4 minutes per side, depending on thickness of the fillets. Serve the tilapia topped with mango salsa. From 1 lime, grate 1 teaspoon of peel and squeeze 1 tablespoon juice into a large bowl. Cut the remaining lime into wedges and reserve for squeezing juice over cooked burgers. In the large bowl containing the lime peel and juice, blend in yogurt, oil, ginger, cumin, coriander, and garlic. Divide ground turkey into 4 burgers. 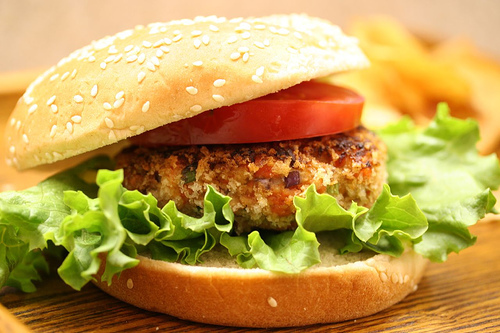 Just before grilling, add turkey burger to the bowl and coat with yogurt mixture. 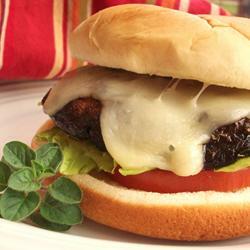 Do not marinate burgers in yogurt mixture because texture may become altered. Place turkey burgers on grill over medium heat until done. Serve with lime wedges. You may choose to serve burgers alone or on a whole wheat bun. 2. Heat 3 tablespoons oil in a large Dutch oven over medium heat. Add onion to pan; cook 5 minutes or until browned, stirring occasionally. Add spinach, 1 bag at a time; cook 3 minutes or until spinach wilts, stirring frequently. Simmer spinach mixture 40 minutes or until liquid evaporates. Stir in raisins. Remove from heat; cool completely. Stir in cheese, nuts, salt, and pepper. 3. Press 1 phyllo sheet into bottom and up sides of a 13 x 9–inch baking dish coated with cooking spray (cover remaining dough to keep from drying); lightly coat phyllo with cooking spray. Repeat procedure with 7 phyllo sheets. 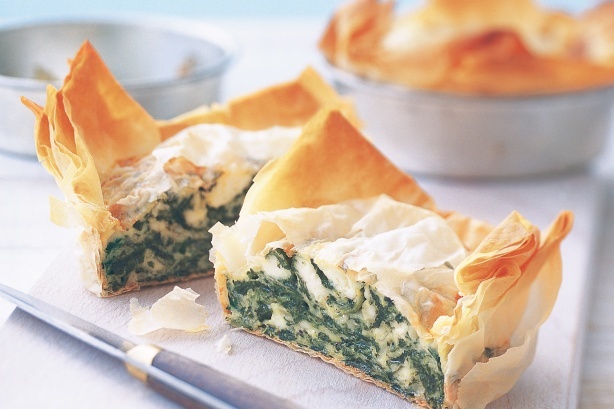 Spread spinach mixture in an even layer onto phyllo. Place 1 phyllo sheet on a large cutting board or work surface (cover remaining dough to keep from drying); lightly brush with 1 1/2 teaspoons oil. Repeat procedure with the remaining 3 phyllo sheets and the remaining 1 1/2 tablespoons oil. Place phyllo layer over spinach mixture; tuck in sides to enclose spinach fully. Bake at 400° for 30 minutes. Remove from oven; let stand 15 minutes. 2. Combine first 9 ingredients in a large zip-top plastic bag. Add salmon to bag; seal. Marinate in refrigerator 1 hour, turning occasionally. Remove salmon from bag, reserving marinade. Strain marinade through a sieve into a bowl; discard solids. Place marinade in a small saucepan over high heat. Bring to a boil; cook until reduced to 1 cup (about 6 minutes). Combine 1 tablespoon water and cornstarch in a small bowl, stirring with a whisk. Add cornstarch mixture to pan; bring to a boil. Cook 1 minute, stirring constantly. Add orange sections; cook 30 seconds. Set aside; keep warm. 3. Place salmon on a broiler pan coated with cooking spray; broil 8 minutes or until desired degree of doneness. Serve with sauce. Sprinkle with green onion strips. 1. Sprinkle chicken with salt and 1/4 teaspoon pepper. Add chicken to 2 Tbsp olive oil in pan; cook 5 minutes on each side or until browned. Remove chicken from pan. 2. Add onion and next 5 ingredients (through bay leaves); cook 5 minutes. Add tomato paste; cook 1 minute. Stir in wine; bring to a boil. Cook 10 minutes or until reduced by half, stirring occasionally. Return chicken to pan. Add broth; bring to a simmer. Cover and simmer 35 minutes or until chicken is done, turning after 20 minutes. Remove chicken from pan; cover. 3. Heat a large heavy skillet over medium heat. Add olive oil to pan, and swirl to coat. Add button mushrooms and pearl onions; sprinkle with remaining 1/4 teaspoon pepper. Cook for 10 minutes or until golden, stirring occasionally. Remove from heat. Directions: Preheat oven to 350°F. Combine first 4 ingredients in a small saucepan; bring to a boil. Reduce heat, and simmer until Marsala mixture is reduced to 2/3 cup (about 8 minutes). Remove from heat. Trim fat and rind from ham. Score outside of ham in a diamond pattern; stud with cloves. Place ham on a broiler pan coated with cooking spray. Brush ham with ¼ cup Marsala mixture. Bake at 350°F for 1 hour. Baste with ¼ cup Marsala mixture; bake an additional 1 ½ hours or until thermometer registers 140°F. Baste with remaining Marsala mixture, and bake an additional 10 minutes. Remove from oven; let stand 15 minutes before slicing. Directions: Preheat oven to 425°F. Remove giblets and neck from turkey. Pat turkey dry. Trim excess fat. Starting at neck cavity, loosen skin from breast and drumsticks, gently pushing between skin and meat. Lift wing tips up and over back; tuck under turkey. Combine butter, chopped sage, thyme, 1 ¼ teaspoons salt, marjoram, and ½ teaspoon pepper; rub mixture under loosened skin and over the breast and drumsticks. Place onion, celery, and sage leaves in turkey cavity; tie legs together with kitchen string. Let stand at room temperature for 30 minutes Place turkey, breast side up, on the rack of a roasting pan coated with cooking spray. Pour 2 cups turkey broth in bottom of pan; place rack in pan. Bake turkey at 425°F for 30 minutes. Reduce heat to 325°F (do not remove turkey from oven). Bake at 325°F for an additional 1 hour and 45 minutes or until a thermometer inserted into meaty part of thigh registers 165°F. Remove turkey from pan; cover loosely with foil. Let turkey stand 20 minutes. Discard skin. Place a large zip-top plastic bag inside a 4 cup glass measure. Pour dripping through a fine sieve into bag. Let stand 10 minutes (fat will rise to the top). Seal bag, carefully snip off one bottom corner of bag. Drain drippings into a medium bowl, stopping before fat layer reaches opening; discard fat. Add 2 cups turkey broth to drippings to equal 3 cups. Combine cornstarch and 3 tablespoons water in a small bowl, stirring with a whisk. Bring broth mixture to a boil; stir in cornstarch mixture. Bring to a boil; reduce heat, and simmer 5 minutes or until thickened, stirring frequently. Stir in remaining ½ teaspoons salt and remaining ¼ teaspoon pepper. Serve gravy with turkey. Heat grill to high. Combine pesto with lemon juice and pour over the chicken in a nonreactive dish. Rub mixture into chicken and set aside. Slice up tomatoes and place in a bowl. 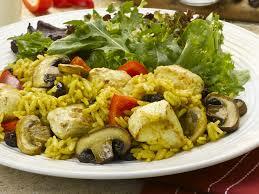 In another bowl, combine oil, vinegar, garlic, mustard, basil, remaining 1 tablespoon lemon juice, and black pepper. Pour mixture over tomatoes and mix. 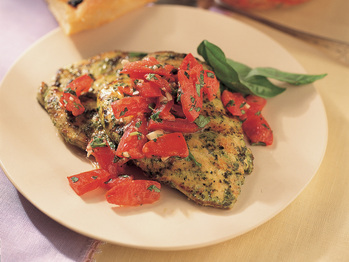 Remove chicken from pesto and grill, turning once, until golden on both sides and cooked through. Transfer the chicken to a platter and serve with tomato mixture on top. 1. Cut off tops of peppers and remove seeds. 4. Combine pasta sauce and water. Pour 1/2 into a slow cooker. Add stuffed peppers. Top with the remaining sauce. Sprinkle with cheese. 5. Cover and cook on low for 3 1/2 to 4 hours. 1. Bring a medium pot of water to a boil. Add half the carrots and potato and boil until soft, about 10 min. Mash the carrots and potato by hand or puree them in a blender. 2. In a large stockpot, over moderate heat, warm the olive or vegetable oil. Add the onion, bell pepper, garlic and the remaining carrots and sweet potato and sauté until soft, about 5 minutes. Add the chili powder, cumin, chipotle pepper, salt and pepper and cook for 3 minutes. Add the tomato puree and tomatoes and sweet potato and carrot puree and stir well to combine. Add the black and cannellini beans and simmer for 30 min. 1. Preheat oven to 375 degrees and line a large baking sheet with parchment paper or aluminum foil. 2. Bring a medium pot of water to a boil. Add the sweet potato slices and cook until tender, about minutes. Transfer the sweet potato slices to a bowl and use a fork to mash them. Add the ground turkey, oats, onion, garlic , egg, ricotta cheese, parsley, maple syrup, cayenne pepper, salt and pepper and stir to combine. Shape the mixture into 12 meatball-size sliders and place them on the prepared baking sheet. Bake the sliders, turning them once, for 35 min. 3. Top each slider with a half a piece of cheese and serve them on the mini whole what buns. Garnish with spinach, pickles, tomato, mustard, and ketchup. In a medium bowl, toss together the chicken, avocado, bell pepper, tomato and cheese. Season with salt and pepper. Scoop into tortilla bowl and serve immediately. 1. 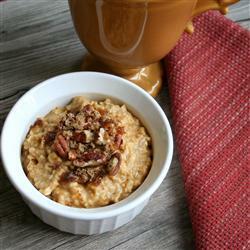 Mix milk, oats, pumpkin puree, cinnamon, salt, ginger, allspice, and nutmeg together in a 4 quart microwave-safe bowl. 2. Cook in high for 12-15 minutes, stirring once. Sprinkle brown sugar and pecan pieces over the oatmeal to serve. In a small bowl, toss 1 pint strawberries, rinsed, hulled, and thinly sliced with 1 to 2 tablespoons firmly packed Splenda brown sugar blend. Let stand for at least 5 minutes to bring out the juices. In a saucepan over medium heat, warm the water and milk. Stir in quick-cooking oats. Cook for approximately 5-6 minutes, stirring occasionally, until thick and creamy. 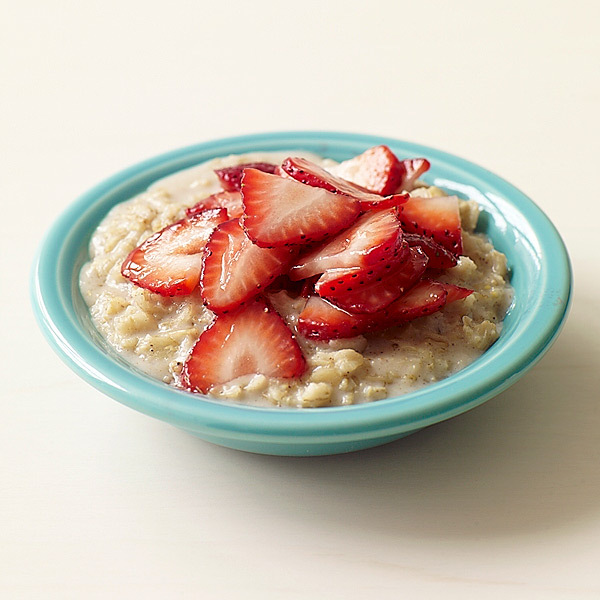 Ladle oatmeal into bowls. Top each serving with 1 tablespoon nonfat sour cream and strawberry mixture. 2. Cut squash in half and remove seeds and fiber. Remove peel and cut the flesh into 1 inch cubes. 3. Combine the squash, garlic, olive oil, salt, shallots and ginger in a roasting pan and bake for 50-60 minutes until tender, stirring occasionally. Cool 10 minutes. 4. In a blender, combine half of the squash mixture with 1 cup of chicken broth and blend until smooth. Place mixture in a large saucepan. Repeat with the last half of the squash mixture. 5. Stir in the remaining 2 cups of chicken broth. 6. Bring the mixture to a simmer over medium heat and cook for 5 minutes. 7. Top with chives and serve immediately. Heat a medium soup pot over medium to medium high heat. Add the oil and melt the butter. Add bay, celery, and onion. Season the veggies with salt and pepper. Cook 6 or 7 minutes, until tender. Add flour, poultry seasoning and hot sauce, to taste, then cook flour a minute. Whisk in chicken stock and bring liquid to a bubble. Whisk in pumpkin in large spoonfuls to incorporate it into the broth. Simmer soup 10 minutes to thicken a bit then add in cream and nutmeg. Reduce heat to low and keep warm until ready to serve. While soup cooks, assemble the relish: combine apple, onion, lemon juice, cranberries, chili powder, honey and cinnamon. Adjust seasonings in soup and relish and serve soup in shallow bowls with a few spoonfuls of relish. Combine the chopped onion, apple and butter and cook in a skillet until soft. Add the chicken broth and mustard. Once that is well mixed, add the chicken. Cover and poach over low heat until cooked thoroughly, about 15 minutes. Add pepper and dill to season. 2. Coat a baking sheet with cooking spray. Remove skin from wings. 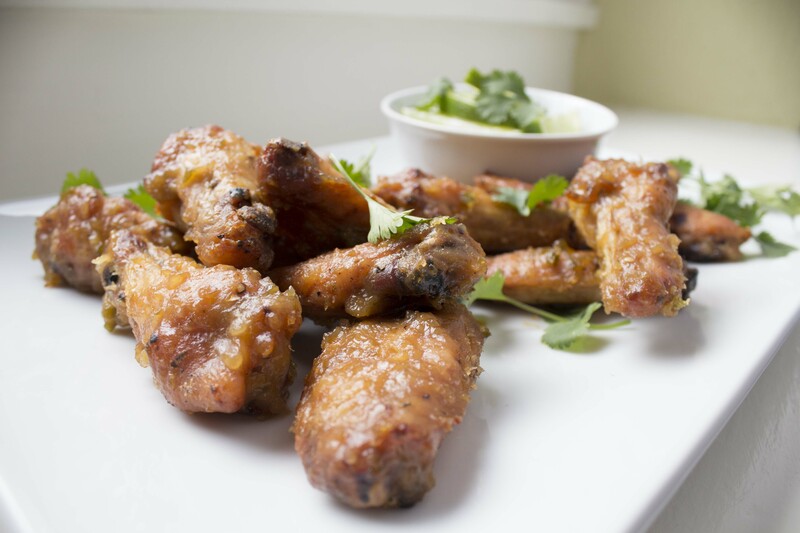 Lay chicken wings in a single layer on the baking sheet and spray again with cooking spray. 3. Bake for 10 minutes. While the chicken is baking, whisk apricot preserves, 2.5 teaspoons of garlic, soy sauce, chili garlic sauce, lime juice and ¼ teaspoon ground black pepper together and set aside. 4. After the wings have been in the oven for 10 minutes, coat them generously with the apricot preserve mixture. Return to the oven for another 15 minutes or until wings are cooked through and glazed is caramelized. 5. 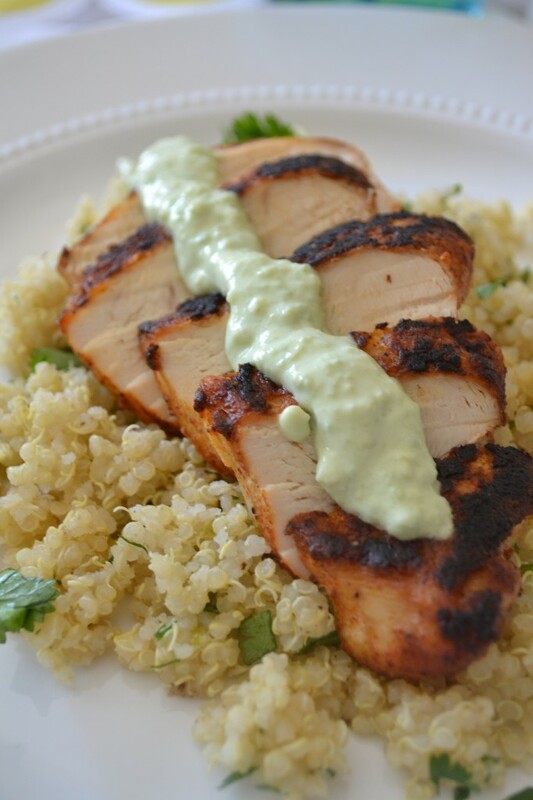 In a small bowl, whisk together Greek yogurt, 1 tablespoon lime juice, cilantro and ¼ teaspoon ground black pepper. Serve dipping sauce with hot wings. Fold 1 slice roast beef inside each soft tortillas and sprinkle with cheese. 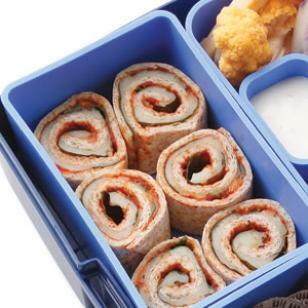 Pack in the biggest compartment of the lunch box. Pack other compartments with guacamole, salsa, sour cream and other favorite toppings. Seal and send off to school. Place the whole-wheat tortillas on a work surface and spread a thin layer of cream cheese. Add turkey slices, tomato slices, and spinach leaves. Roll the tortillas and use a serrated knife to cut into 1-inch slices. Use a toothpick to keep the rolls in place. 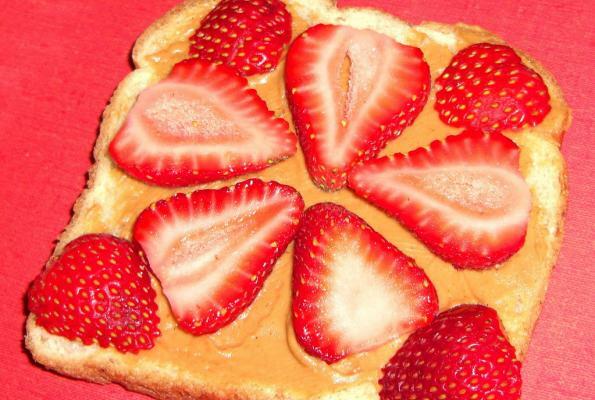 Arrange strawberry slices on top of the peanut butter. Drizzle the honey on the berries and then place the other slice of bread on top. Cut into quarters. 2. 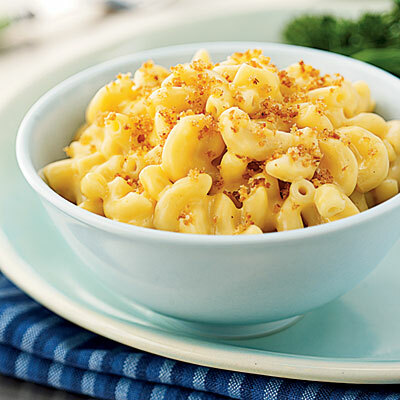 Combine the honey, thyme, mustard, lemon zest, and pepper in a small bowl. Arrange the salmon in a shallow roasting pan lined with cooking foil. Using the back of a spoon, spread the honey mixture to coat the top of each fillet. 3. Bake, uncovered, for 20 minutes, or until the salmon flakes with a fork. Beginning and ending with salmon, thread salmon and folded lemon slices onto 8 pairs of parallel skewers to make 8 kebabs total. Brush with oil and season with reserved spice mixture. 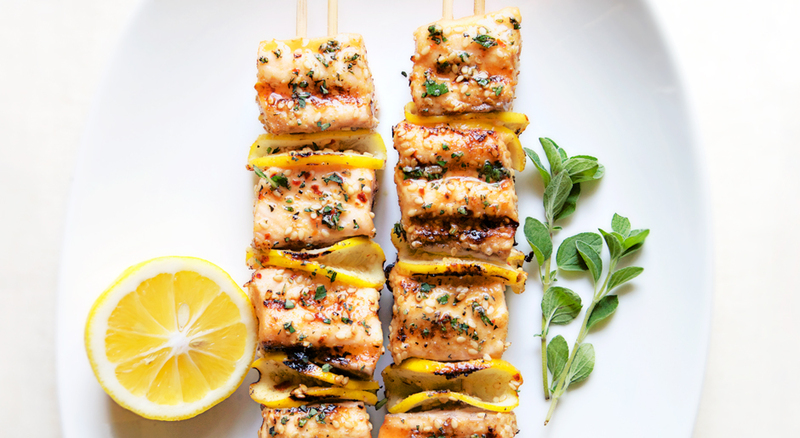 Here’s a little trick: Thread salmon pieces onto two skewers so they don’t flip and spin every time you turn them on the grill. Grill, turning occasionally, until fish is opaque throughout, 5-8 minutes. Sprinkle both sides of pork with ground black pepper. Grill pork, turning occasionally, for 10 minutes. Brush pork with 2 tablespoons of preserves and continue grilling until an instant-read thermometer inserted into the thickest part registers 155-160 degrees F.
Grill apricot halves on the coolest part of the grill, turning occasionally, until tender and marked, about 4 minutes. Transfer pork and apricots to a clean cutting board and cool. Meanwhile, whisk the remaining 2 tablespoons of preserves, vinegar, onion, oil, ground black paper in a large bowl. Cut the grilled fruit into wedges and add to the dressing along with arugula. Toss to coat. Thinly slice pork. Serve the salad with the sliced pork. Combine sliced onion, carrot, spinach, red bell pepper and chopped cucumber in mixing bowel. Mix in red wine vinaigrette and black pepper. Spread layer of hummus on each wrap and then add vegetable mixture. Roll up the wrap and cut in half on a diagonal. In a skillet, heat 1 teaspoon olive oil over medium-high heat. Add chicken to skillet and cook 4 minutes on each side or until browned. Remove chicken from skillet and add tomatoes to the hot pan and sauté for 4-5 minutes until tomatoes become soft and release juices. Add pesto and cream cheese and stir until smooth. Cut chicken crosswise and spoon tomato pesto sauce over chicken. 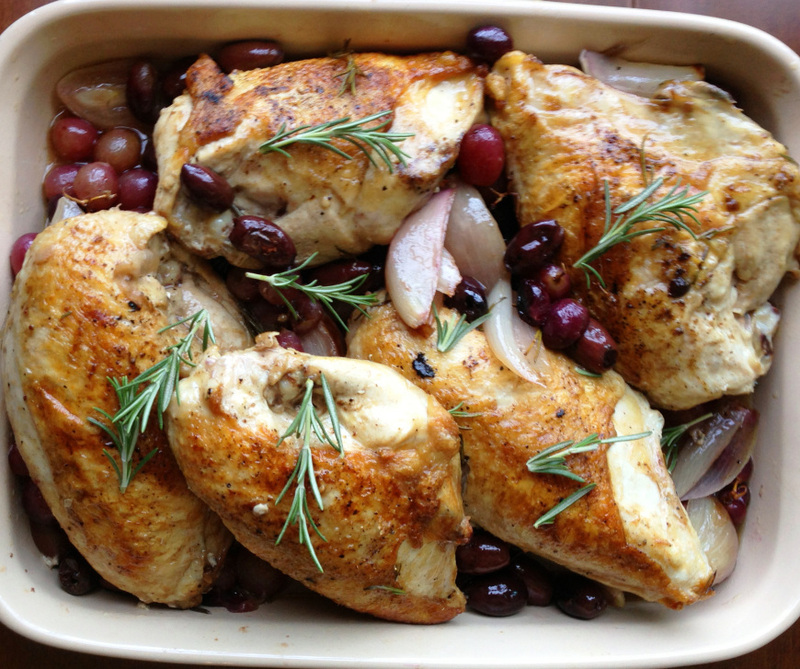 After the chicken has browned add 1 teaspoon olive oil, grapes, thyme, and shallots to the skillet with the chicken. Mix all ingredients well. Once mixed, transfer all into a glass baking dish and bake uncovered at 425 degrees for 22-25 minutes or until chicken is done. Slice beef across the grain into 1/4 inch strips. Place in a medium bowl with 1/2 Tbsp fiesta lime seasoning. Toss to coat. Place mushrooms, peppers, onion, and 1/2 Tbsp fiesta lime seasoning in a large bowl. Toss to coat. Heat oil in large non-stick skillet. Add beef strips and cook about 3-4 minutes. Remove from skillet. Place coated vegetables in skillet and sauté until slightly tender, about 5-8 minutes. Add beef back to skillet and sauté mixture 1-2 minutes. 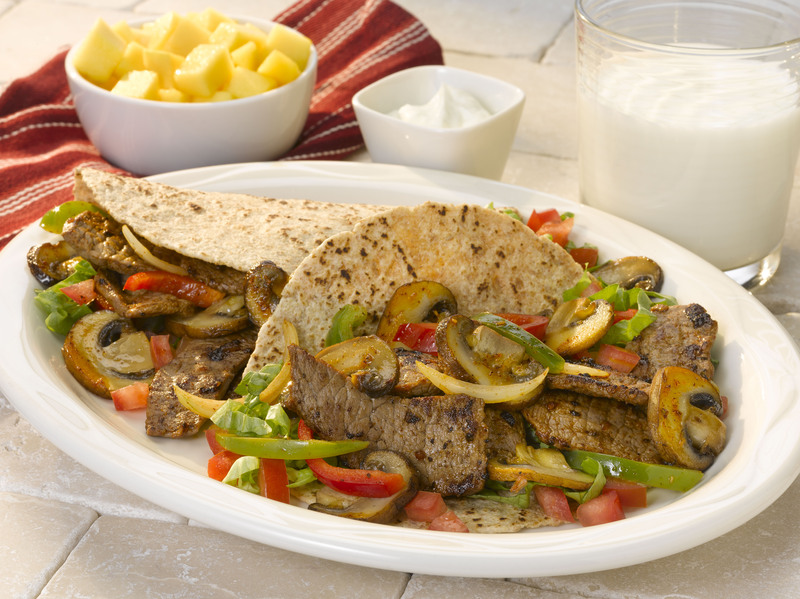 Assemble fajitas by dividing beef-vegetable mixture evenly on each tortilla. Top with remaining ingredients and roll up. Mix together juices, vinegar, oil, and black pepper. Marinate tofu slices in mixture for approximately one hour. Grill on lightly oiled grill over medium heat, basting with marinade throughout cooking, for 10-15 minutes. 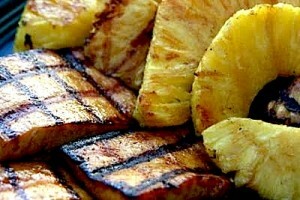 Next, brush fresh pineapple slices with some of the marinade and grill for about 10 minutes. Make sure pineapple browns, but does not burn. In a small bowl, combine balsamic vinegar, olive oil, garlic, black pepper, rosemary and thyme. Place cubed beef in a re-sealable plastic bag set in a medium bowl and then pour marinade over beef. Seal bag and turn to coat. Marinate in the refrigerator for at least 2 hours, turning bag occasionally. Drain beef, discarding marinade. Alternately thread beef, onion, peppers, and mushrooms on eight skewers, leaving ¼ inch spaces between pieces. Place kebabs on rack of uncovered grill on medium heat. Grill 12-14 minutes or until meat is cooked through, turning occasionally. Add cherry tomatoes to the end of each skewer and serve. If the tofu you purchased is not in water then you do not need to press. If you do need to press, lay tofu on a plate on top of paper towel and place another paper towel on top of tofu. Press down to remove excess water. Slice tofu into small cubes and put into a nonstick skillet. Drizzle olive oil over tofu and mix in taco seasoning. Heat over medium-high heat and cook until tofu begins to crisp (about 5 minutes). In a mixing bowl, mix together 1 garlic clove (use garlic press), cilantro, ground pepper, 1 tablespoon of lime zest, juice from ½ a lime, and Greek yogurt. Warm up the tortillas according to directions listed on package. Fill each tortilla with tofu, cheese, radishes, coleslaw, and top with yogurt sauce and salsa. Serve each soft taco with a lime wedge. Drain salmon and place in a medium mixing bowl and flake. Fold in green onions, red pepper, crushed crackers, lemon juice, egg whites and yogurt. Coat large nonstick skillet lightly with cooking spray and heat over medium heat. Cook salmon burgers until golden brown. Turn and continue cooking until the other side is golden brown. 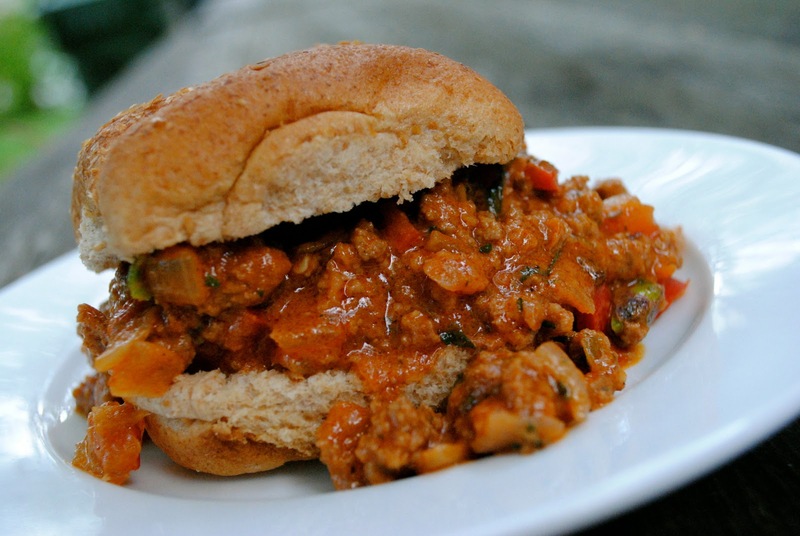 Serve with lettuce and tomatoes on a whole-wheat bun. Cut mangoes, vegetables, and chicken. Place in a mixing bowl and toss until well mixed. In a small mixing bowl, whisk together cream cheese, peanut butter, and soy sauce. To assemble: lay out tortillas on a flat surface. 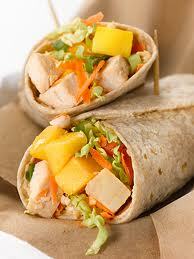 On each tortilla, spread 1/4 of cream cheese mixture and top with mango, vegetable, and chicken mix. Roll up tightly, tucking in ends of tortilla. Secure with toothpicks. To serve, cut each wrap in half. If not serving immediately, refrigerate. • Fill the skillet 2/3rds of the way with salted water and bring to a boil over high heat. • Add the orzo and cook according package instructions until it’s al dente. • Drain and set aside, transfer to a bowl, and toss with a little vegetable or canola oil. • Wipe out skillet and return to medium high heat. Add oil and heat until shimmering. • Add garlic and chili flakes and cook, stirring, until fragrant but not browned, about 1 minute. • Add the asparagus, season with salt and pepper and stir to coat the asparagus. • Cook until the asparagus is tender but retains a crisp bite, 3 to 4 minutes. 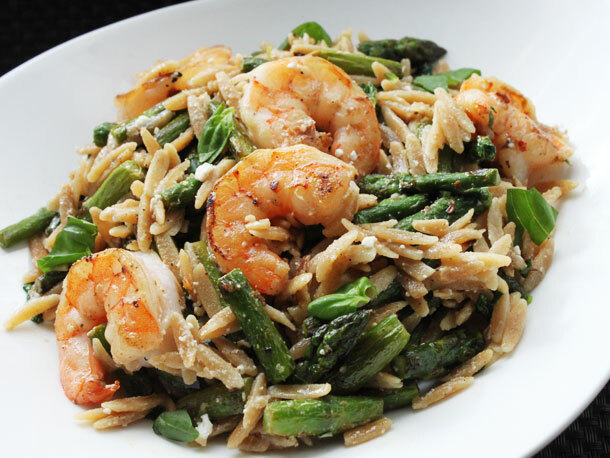 • Move the asparagus to the sides of the pan and add the shrimp. Cook, turning shrimp occasionally, until pink and opaque, about 4 minutes total. • Add the orzo back to the pan, stirring to combine, along with most of the basil, the lemon juice, extra-virgin olive oil and feta. • Toss to combine, allow orzo to heat through, season to taste with more salt and pepper as desired, and serve immediately, topped with remaining basil. • Bring 4-6 quarts of water to a rolling boil. Add a splash of olive oil. • Add spaghetti to the boiling water. Stir gently. • Boil uncovered, stirring occasionally for 7-8 minutes. • Remove from heat and drain well. • In a large skillet, heat ¼ cup olive oil over medium-high heat. Add garlic and tomato. Cook until tomato skins start to soften. 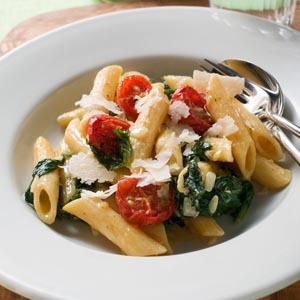 • Serve the sautéed spinach and tomatoes over the cooked spaghetti. Sprinkle with parmesan cheese. • Bring a large pot of water to a boil. Cook pasta for 4 minutes. • Add frozen broccoli and continue cooking, stirring occasionally, until the pasta and broccoli are tender, 4 to 5 minutes more. • Meanwhile, heat 1 1/2 cups milk in another large pot over medium-high heat until simmering. • Whisk the remaining 1/4 cup milk, flour, garlic powder, salt and pepper in a small bowl until combined. Add the flour mixture to the simmering milk, return to a simmer and cook, whisking constantly, until the mixture is thickened, 2 to 3 minutes. • Remove from the heat and whisk in cheddar, parmesan, and mustard until the cheese is melted. • Drain the pasta and broccoli and add to the cheese sauce. • Return to the heat and cook, stirring, over medium-low heat, until heated through, about 1 minute. • Squeeze juice from the 3 limes into a bowl. • Mince garlic and add to lime juice. Add salt and pepper to taste. 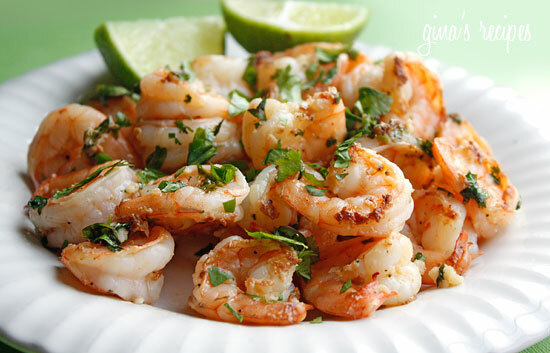 • Clean, peel and de-vein shrimp (I have used precooked shrimp in the past as well). Add them to lime/garlic mixture. • Heat a large skillet over medium high heat. Cook shrimp until 3 to 5 minutes or until shrimp are opaque throughout. In a large nonstick saucepan, brown turkey and onion; drain. Add onion, tomatoes, beans, green chilies, olives and taco seasoning mix and bring to a boil. Reduce heat; cover and simmer for 15 minutes. Return to a boil. Stir in rice and removed from heat. Cover and let stand for 5 minutes. Spoon 1/2 cup into each tortilla. Fold in sides. To prepare the mushrooms, remove and discard the stems and scrape out the gills. Wipe caps clean with a damp paper towel. When the grill is hot, brush the grate with oil. Place the mushrooms on the grill, reserving marinade for basting. 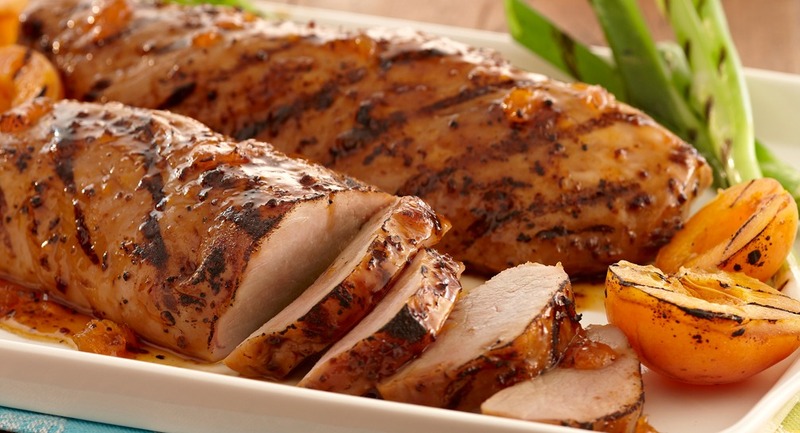 Grill for 5 to 7 minutes on each side, or until tender, brushing with marinade frequently. To finish, place the spinach and grilled Portobello mushrooms on the buns and top with the grilled onions, sliced tomato and avocado. • Combine paprika, pepper, onion powder, and cumin in a bowl. Mix together and use to season both sides of a chicken breast. • Add the olive oil to a skillet and heat over medium/high heat. • Add chicken, cover with lid, and cook for 7 minutes on each side. Slice chicken once it has cooled. • Add chicken stock, garlic and quinoa to medium saucepan. Bring to simmer over medium/low heat. Reduce to low and simmer for 5-10 minutes with lid on. Add black beans and continue to simmer for an additional 5 minutes, until all the stock has been absorbed. • Toss quinoa and black bean mixture with lime juice, salt and pepper, and fresh cilantro. Set aside. • Combine avocado, Greek yogurt, and lemon juice in a food processor. • Stop the quinoa and black bean mixture with sliced chicken and avocado yogurt sauce. 1. Place oven rack in center of oven; preheat to 375 degrees F.
2. Remove portabella stems. Wipe clean with a damp paper towel. 3. Spray baking sheet with cooking spray, and place mushroom caps on baking sheet. 4. In a mixing bowl, whisk together all remaining ingredients, except for 1 Tbsp Parmesan cheese. 5. Coat 10-inch non-stick pan with cooking spray and heat over medium flame. 6. Cook and scramble egg mixture until it just starts to thicken. Remove from heat. 8. Sprinkle tops with remaining Parmesan cheese. Bake about 20 minutes. 1. Spray a medium skillet with cooking spray and Combine ground beef, diced peppers, and onion in the skillet. Cook on medium heat until the beef is thoroughly cooked, about 8-10 minutes. 2. Mix the vinegar, catsup, and mustard together. Add to the beef mixture and simmer 10-15 minutes. 3. Scoop ¾ c onto each sandwich bun and top with a slice of sweet onion. 1. In a large bowl, combine all the ingredients and mix well. 2. Evenly divide the mixture between 4 large pieces of aluminum foil. 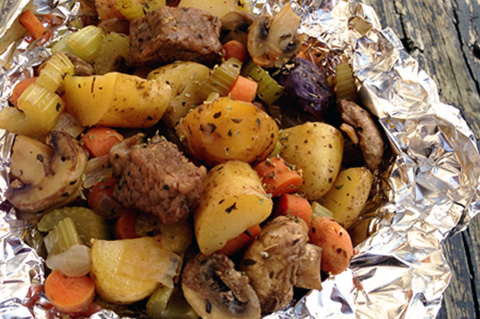 Bring the longer edges of the foil together in the middle to form a tent over the food. Fold the ends together three or four times, creasing it well. Pinch the ends well to be sure that there is no leaking. 3. Cook in the hot coals of a campfire until the meat is browned and the vegetables are tender, about 15-30 minutes. 4. Serve right out of the foil packet. Top with shredded cheddar cheese if desired. Trim fat from meat. Cut meat into 1-inch pieces. Place flour into a large re-sealable plastic bag. Add meat pieces, shaking to coat. In a large skillet, heat oil over medium heat. Brown meat in hot oil. Drain off fat. 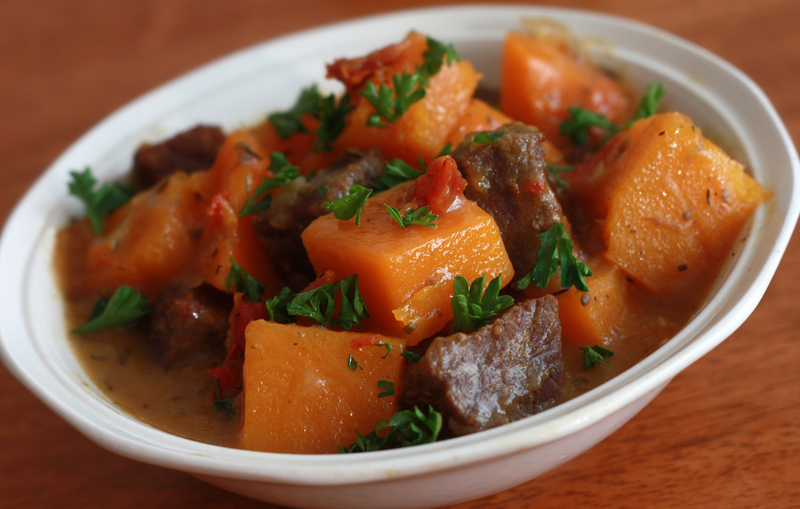 In slow cooker, combine meat, potatoes, squash, onions and garlic. In a large bowl, combine broth, vegetable juice, Worcestershire sauce, lemon juice, sugar paprika, pepper and allspice. Pour over meat mixture. Cover and cook on low-heat setting for 10 to 12 hrs or on high-heat setting for 5 to 6 hours. If using low-heat setting, turn to high-heat setting. Stir in green beans. Cover and cook for 15 minutes more. 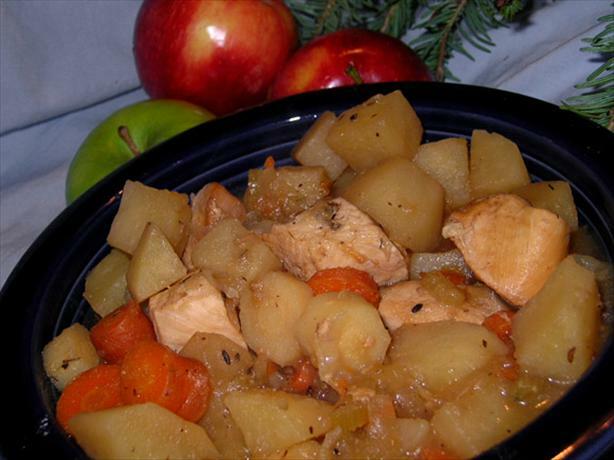 In a slow cooker, layer potatoes, carrots, onion and celery. Combine thyme, pepper and caraway; sprinkle half over vegetables. In a skillet, sauté chicken cubes in oil, until browned. Transfer to a slow cooker. Top with apple. Combine the apple cider and vinegar. Pour over chicken and apple. Sprinkle with remaining salt mixture. Top with bay leaf. Cover and cook on high for 4-5 hours, or until vegetables are tender and chicken is cooked. Remove the bay leaf before serving. In a skillet over medium-high heat, brown ground beef with onions. Break up clumps as much as possible. Put mixture into a slow cooker. Add remaining ingredients and stir together. Cover and cook on high setting for 4 hours or on low setting for 7 to 8 hours. 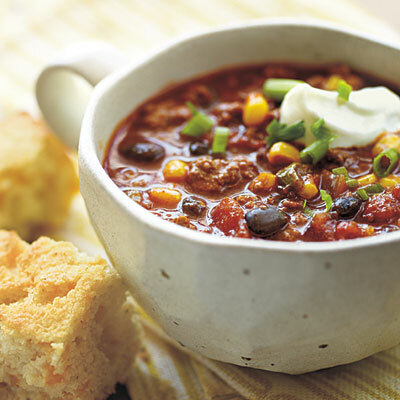 Ladle into bowls and serve with your favorite chili fixings. With heat on medium-high, place chicken in pan and cover with lid. Cook chicken about 5 minutes. Gently mix in raisins, rice and curry powder. Bring to a boil, reduce heat and cover. Simmer until rice is done. Fluff with a fork and let sit 3-5 minutes before serving.